webpage for features and purchasing information. System Requirements: Windows XP, Microsoft Excel 2003 or newer. 50- and 100-component versions are available at no additional cost. 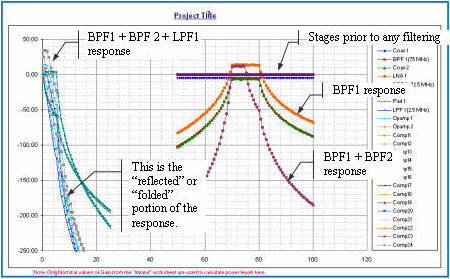 Graham Seale has provided an example of RF Cascade Workbook 2005 running under the Linux OS. 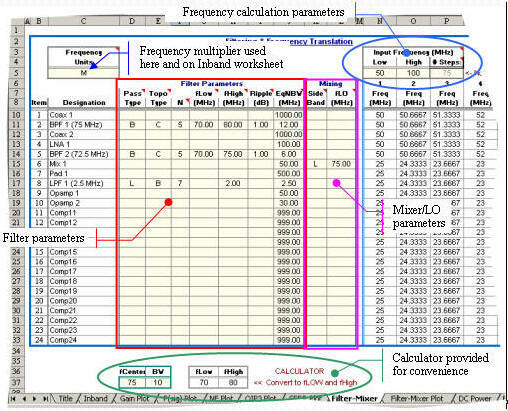 RF Cascade Workbook 2005 (RFCW2005), a sophisticated Excel spreadsheet workbook, is built on the format of RFCW2003, and now includes filter response and frequency conversion. The number of filters and mixers that can be used are limited only by Excel and your computer. 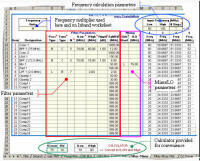 Additionally, 2nd-order calculations that were introduced in RFCW2004 are included. A return to the RF Cascade Workbook 2003 format was chosen because the necessary multi-page format makes adding and deleting components simpler. RF cascade analysis. All of the formulas used in RF Cascade Workbook 2005 are presented in the highly detailed User's Guide to assist in understanding the operation of the spreadsheet. Most calculations are implemented in VBA code, which makes customization more convenient and keeps clutter out of the cells. This is especially helpful in the case of conditional formulas. Expansion of the workbook to include custom calculations is a simple matter. Note: The file is saved in a format that accommodates back through Excel 95. If you are using Excel version 2002 or newer, re-saving the file in the newer format will reduce the file to about half its current size. The User's guide presents useful system design information such as one of the best graphical explanations of spectral inversion you will see (IMHO). Click here to view the entire User's Guide, and then order the software ☺. I have a PDF version of the User's Guide for owners if you write to request it. Thanks. power and signal gain are accounted for. Thanks to Ken H. for the suggestion.